Now Trump’s son in law, Jared Kushner, is calling up Lockheed-Martin to get a discount for the Saudis, personally brokering the biggest arms deal in US history. What a difference a presidency makes! The old Trump told us that the Saudis were “mouth pieces, bullies, cowards,” who were “paying ISIS,” but now they’re our partners in the “war on terrorism.” Why it seems like only yesterday that he was calling out Saudi princes like Alwaleed bin Talal for thinking they can “control our US politicians” – today he’s kowtowing to them. Last week Attorney General Jeff Sessions ordered federal prosecutors in drug cases to seek the maximum penalty authorized by federal mandatory minimum sentencing laws. Sessions’ order represents a setback to the progress made toward restoring compassion and common sense to the sentencing process over the past few years. Sessions’ action also guarantees that many nonviolent drug law offenders will continue spending more time in prison than murderers. Sessions’ support for mandatory minimums is no surprise, as he has a history of fanatical devotion to the drug war. Sessions’ pro-drug war stance is at odds with the reality of the drug war’s failure. Over forty years after President Nixon declared war on drugs, the government cannot even keep drugs out of prisons! The Syrian army is on the way to liberate the ISIS besieged city of some 100,000 and garrison of Deir Ezzor in the east of the country. The U.S. has trained a few thousand "New Syrian Army" insurgents in Jordan and is reportedly prepared to march these and its own forces from Jordan through the east-Syrian desert all the way up to Raqqa and Deir Ezzor. About a year ago it occupied the al-Tanf (al-Tanaf) border station which consists of only a few buildings in the mid of the desert. 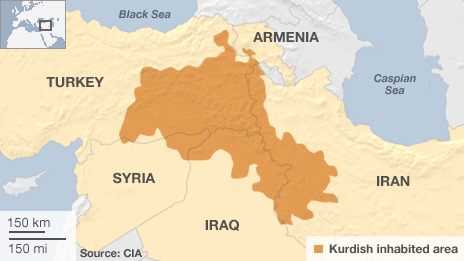 The station between Syria and Iraq near the Jordan border triangle was previously held by a small ISIS group. A U.S. move from the south up towards the Euphrates would cut off the Syrian government from the whole south-east of the country and from its people in Deir Ezzor. While that area is sparsely populated it also has medium size oil and gas fields and is the land connection to the Syrian allies in Iraq. With the western part of the country relatively quiet, the Syrian government and its allies decided to finally retake the south-eastern provinces from ISIS. They want to lift the ISIS siege on Deir Ezzor and close the border between Syria and Iraq with its own forces. The move will also block any potential U.S. invasion from the south by retaking the road to al-Tanf and the Syrian-Iraqi border (red arrows). 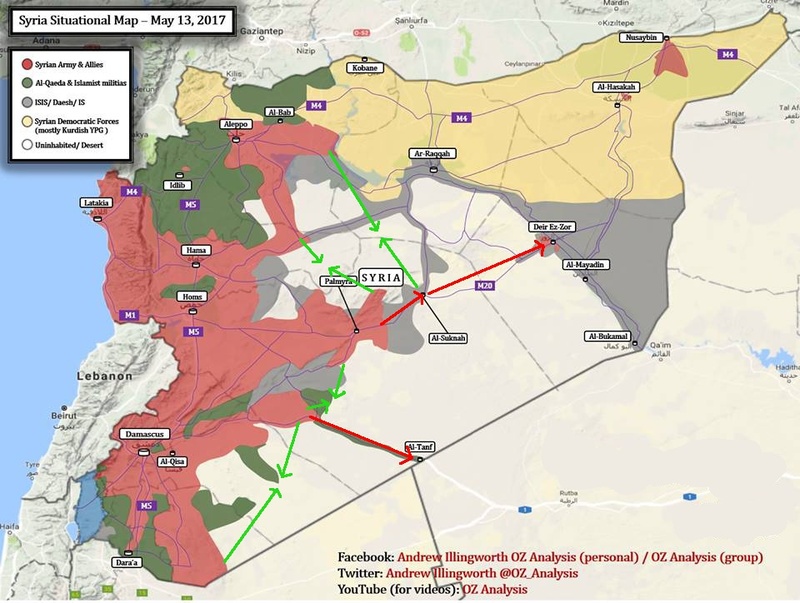 The sovereign Syrian state will not give up half of the country to an illegal occupation by ISIS or the U.S. At the same time as the eastern operations are running consolidation and clearing operations against ISIS in the middle and west of the countries will take place (green arrows). Yesterday a small battalion size force (~2-300 men) of the regular Syrian army, Syrian National Defense Organization volunteers and Iraqi Popular Mobilization Forces (PMF/PMU of the Kata'ib al-Imam Ali) marched on the road from the west towards al-Tanf. Why is it a “conspiracy theory” to think that a disgruntled Democratic National Committee staffer gave WikiLeaks the DNC emails, but not a conspiracy theory to think the emails were provided by Russia? Which is the more likely scenario: That a frustrated employee leaked damaging emails to embarrass his bosses or a that foreign government hacked DNC computers for some still-unknown reason? That’s a no-brainer, isn’t it? Former-DNC employee, Seth Rich, not only had access to the emails, but also a motive. He was pissed about the way the Clinton crowd was “sandbagging” Bernie Sanders. In contrast, there’s neither evidence nor motive connecting Russia to the emails. On top of that, WikiLeaks founder, Julien Assange (a man of impeccable integrity) has repeatedly denied that Russia gave him the emails which suggests the government investigation is completely misdirected. The logical course of action, would be to pursue the leads that are most likely to bear fruit, not those that originate from one’s own political bias. But, of course, logic has nothing to do with the current investigation, it’s all about politics and geopolitics. The fake news is flying thick and fast in Washington this week. On the heels of Donald Trump’s Oval Office visit with Russian Foreign Minister Sergey Lavrov and other American and Russian officials, it finally seemed the fledgling US administration was turning the corner and beginning to focus on moving forward on cooperation with Moscow against radical Islamic terrorism, particularly in Syria. Then the Deep State and mainstream media (MSM) counterattacked. First, they questioned why a TASS photographer was allowed access to the meeting while the American fake news purveyors were not. Then they speculated that maybe Lavrov or Ambassador Sergey Kislyak had planted a bug in the president’s office. Then they charged that Trump had compromised sensitive intelligence (received from Israel) by revealing it to the Russians. Finally they accused Trump of obstruction of justice – an impeachable offense – by his reportedly suggesting to now-fired FBI Director James Comey that he should go easy on short-lived National Security Adviser Michael Flynn, whose scalp was the first the Deep State/MSM gang had nailed to the wall. The whole anti-Trump campaign has been based on criminal leaks of classified or privileged material from within the government. Still, there is no sign of a counterattack. Perhaps Attorney General Jeff Sessions has secretly empanelled a grand jury and indictments of leakers are forthcoming. More likely he has not and is more concerned with whether prosecutors are using too much discretion in the severity of offenses they choose to charge criminal suspects with, or whether states are playing fast and loose with federal marijuana laws. The only brief respite Trump has received against this onslaught has been when he launched cruise missiles against Syria over a false flag chemical attack by jihadists in Idlib, for which the MSM and Deep Staters applauded him. There is reason to fear that Trump, guided by advisers whose policy proclivities mirror those of his critics, may seek the path of least resistance by further bellicose measures.